Manufacturer of a wide range of products which include scaffolding pipe thread machines, cup and lock welding system and hydraulic thread rolling machine 2 roll. Industrial Machinery Corporation is manufacturing and offering Scaffolding Pipe Threading Machines used for Construction Scaffolding material. 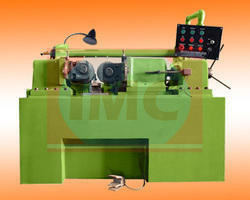 The pipe can be thread by Thread Cutting or Thread Rolling Process. Hydraulic Thread Rolling Machines are used for high production and long threads and Thread Cutting Machines are used for low production and can thread upto 650mm only. 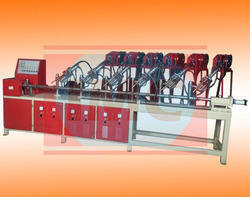 For long thread and high production we recommend you Thread Rolling Machine. This system is based on Circular welding on Cups with Pipe from three positions of cups for Fastest production and Uniform Welding and it helps operator be safe from burning skin of continuous welding process, By using this machine one can save the Consumption of CO2 Gas and weld with proper welding thickness on each single job as per standard required and the production out comes will help them to be competitive in market by fastest supply, clean and safe process of welding. The hydraulic thread rolling machine which is brought to the markets under the aegis of Industrial Machinery Corporation, is one of the best in its domains. This is so because not only does the company have exclusive designs for the thread rolling machines, which make this particular thread rolling machine unique and user friendly, the fact that they utilize the finest grade material for the fabrication, ensures that it is durable and relatively low on factors such as maintenance. In the world of Hydraulic thread rolling machine, perhaps the most extensive range of hydraulic thread rolling machine is offered by IMC. This has been possible after years of extensive research being put in by the team at the company. They have been able to develop a wide range of thread rolling machines, which suit the needs and requirements of a variety of industries. A Hydraulic thread rolling machine is more often than not, fitted with a system that is truly advanced. This allows for the function not just smoothly, but also in a manner that is hassle free. High level quality processes and constant checks also ensure that the amount of money and time spent on maintenance is minimal. Apart from this, there is also the guarantee that the ultimate output offered will be on the higher side. Some of the signs of a good and reliable Hydraulic rolling machine would be that it incorporates features such as a resistance to abrasion and water. The Hydraulic Thread rolling machines have been built to withstand wear and tear as well as breakage. 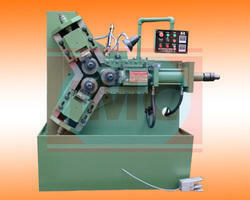 This ensures that whoever invests in this hydraulic thread rolling machine, receives full value for the money spent. Companies like Industrial Machinery Corporation offer hydraulic thread rolling machine that are fabricated in accordance with the specifications provided by the customer. These include sizes for bolts, bars, rods etc. Power for Hydraulic Pump 2 H.P. 3 H.P. 5 H.P. 5 H.P. 5 H.P. 7.5 H.P. Power for coolant pump 0.1 H.P. 0.1 H.P 0.1 H.P 0.1 H.P 0.1 H.P 0.1 H.P.